Stay at least 2 nights with us and get a FREE WALKING TOUR coupon! We opened our Hostel with enthusiasm in October 2008. Our goal was to establish an accomodation in the downtown of Budapest, where you get the maximum for your money -> QUALITY, FUN, you will be more than satisfied while staying with us. 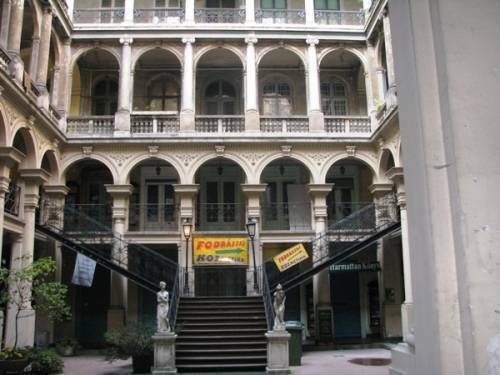 Being in between the two main metro lines, the closeness of the famous Váci street, the River Danube, the Buda side, the Deak square and the covered Market Hall make the location of the Hostel unbeatable. We recommend ourself to those guests, who wish to stay in a real backpacker hostel, surrounded by the main attractions of Budapest, be in the neighbourhood of restaurants, cafes and party places. We offer a newly furnished double room, just next to the kitchen. The room is next to the shared bathroom and the common room. 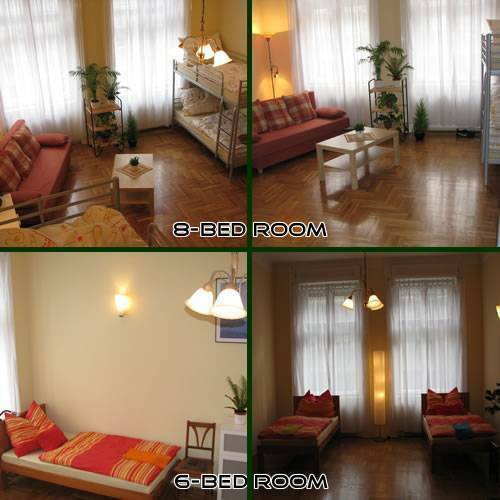 Ideal for two persons, who would like to be seperated in a single room. Please note that 3 persons can also sleep in the double room, but you have to let us know in advance. Fresh fruit, snack and juice are also included in the price. Our biggest room is excellent for those, who are not bothered by talk. This room has a small COMMON ROOM in itself, where you can have a rest after your tiring day. During the daytime the room is flooded by sunshine. Huge room with relaxed atmosphere, next to the kitchen. 2 bunk beds and 2 single beds are in the room. This room is perfect for smaller groups and located a bit away from the 6 and 8-bed room, making your stay a little more private. Use the internet, watch TV, listen to music or just sit and relax with other guest in our inviting, cosy common room. We also provide games, such as cards or chess to have fun and create social atmosphere inside the accomodation. Our kitchen has brand new furniture, providing all the neccessary tools to those guests who like cooking. We also have a dishwasher, so you do not have to bother yourself by having to wash your dishes. Please note that all the bathroms are shared. you find in walking distance metro and bus stops, ATMs, restaurants, party places and all the major sights. And get home in minutes even in the middle of the NIGHT! Early and late check-in is possible, but please inform us in advance! Have a nice day, we are waiting for YOU! Double room: We offer a newly furnished double room, just next to the kitchen. The room is next to the shared bathroom and the common room. 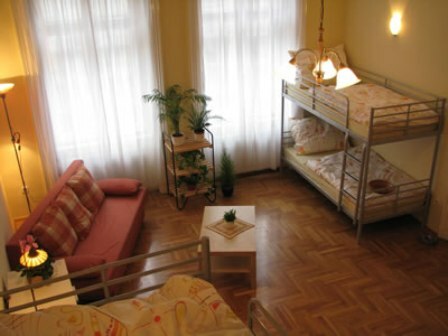 Ideal for two persons, who would like to be seperated in a single room. Please note that 3 persons can also sleep in the double room, but you have to let us know in advance. 8-bed room: Our biggest room is excellent for those, who are not bothered by talk. This room has a small COMMON ROOM in itself, where you can have a rest after your tiring day. During the daytime the room is flooded by sunshine. 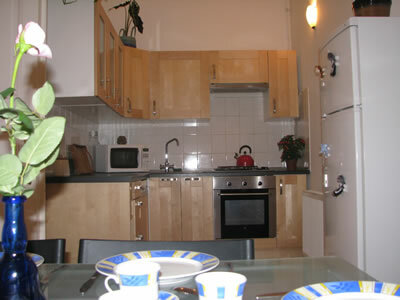 6-bed room: Huge room with relaxed atmosphere, next to the kitchen. 2 bunk beds and 2 single beds are in the room. 4-bed room: This room is perfect for smaller groups and located a bit away from the 6 and 8-bed room, making your stay a little more private. Payment for the total period you booked is due before the very first night. 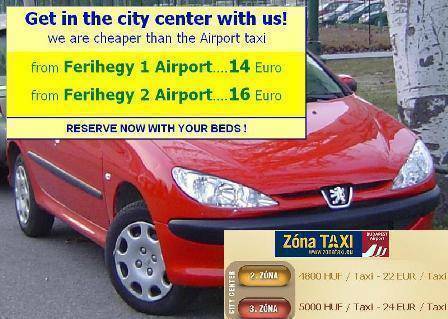 Take the airport bus (200) to the last stop (Kobanya-Kispest) and take the blue metro to Ferenciek tere. From Ferenciek tere, at the top of the escalator, take the far right exit. Walk up the street to reach the house numbered 14-16. Push the bell 90. Go underground and catch the red metro line to Astoria. Take the escalator upstairs and walk to the far right exit. Walk straight ahead 70 meters until you reach the house, number 14-16. Push the bell 90. Go underground and catch the blue metro line to Ferenciek tere. From Ferenciek tere, at the top of the escalator, take the far right exit called . Walk up the street to reach the house numbered 14-16. Push the bell 90.